At Ikes Boulder in Cecillia Forest, Clinton Martinengo made a fast first ascent of the "The Executioner" 7C+. 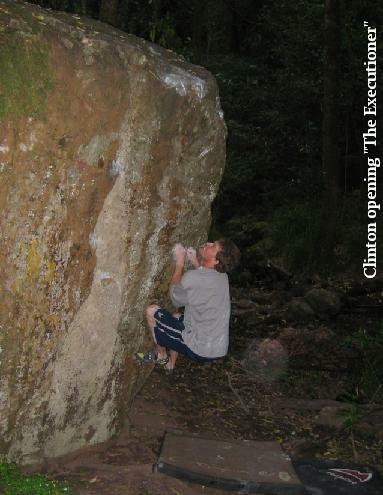 Clinton almost sent the problem in the last 20 minutes of daylight in one evening session, but kept missing the finishing hold and had to come back the next day for the send. The name refers to the hard dyno that one must execute in order to do the problem, which is then followed by a tricky mantle top out.